It’s time for a contest! In one corner, we’ve got the traditional orthodontic solution people have trusted (and dreaded) for decades — conventional metal braces. In the other, we’ve got Invisalign, clear braces for adults and teens. Which will win? We’ve got a good guess if you’re taking bets. Your dentist in Las Cruces weighs in with more! 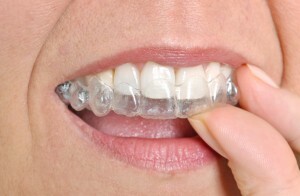 Conventional braces and Invisalign’s clear plastic solution both produce the same final result, straighter teeth and a well-aligned bite. But your experience throughout both treatments is totally different. If the contest is between which one is more subtle, convenient, and comfortable, there is a clear winner. It’s Invisalign, clear braces for older teens and adults. Invisalign works using a series of clear, plastic aligners to gradually shift your teeth into the preferred position. Over a period of one year, on average, you will wear each tray for two weeks before advancing to the next in the system. Appearance: There’s no hiding metal braces. But with Invisalign, while those closest to you may already know you are undergoing orthodontic treatment, acquaintances and colleagues are unlikely to notice the subtle Invisalign trays. These clear, smooth plastic aligners blend flawlessly with your smile — so there’s no need to worry about covering up your teeth or hiding your confident grin throughout treatment. Comfort: It won’t come as a surprise that smooth plastic is far more comfortable than metal brackets and wires, which often rub blisters or sore spots in the cheeks and other soft tissues. With Invisalign, the only thing you are likely to feel is slight soreness as your teeth gradually shift into the preferred position. Convenience: Because the Invisalign trays are removable, you don’t have to limit your diet at all throughout treatment. Wearers of traditional braces must eliminate items like popcorn and caramel to protect their delicate hardware — but Invisalign allows you to slip out the trays to continue enjoying all your favorite meals and snacks. Health: Removable trays also allow you to continue brushing and flossing without learning any special techniques. Unlike traditional braces, Invisalign won’t increase your risk of developing tooth decay or gum disease! Busy adults and teenagers who can’t bear the thought of wearing metal braces agree: Invisalign is the only option in orthodontics. In fact, 4 million people worldwide have had similar thoughts! Because Invisalign uses the same orthodontic principles as traditional braces, the treatment can fix any malalignment that is treatable with metal braces. That includes gapped teeth, crowded teeth, overbite, underbite, and crossbite. Orthodontic treatment is most successful in patients who enjoy healthy teeth and gums, so you should have a checkup and cleaning with your dentist beforehand to make sure your smile is ready for clear braces. If you would like to benefit from straighter teeth and a more confident smile, what are you waiting for? We would love to help you accomplish both with Invisalign in Las Cruces. Request an appointment today!